KARS. – The Third Armenian-Turkish business forum continued on Saturday in Kars, Turkey,Armenian News-NEWS.am special correspondent reports adding Armenian and Turkish businessmen already hold active negotiations on Friday. The photo coverage of the forum is available here. Part of businessmen of both states managed to arrive to an initial agreement. Information and Support Center representatives of both states also participated in the forum and offered their services on providing legal information. The Support to Armenia-Turkey Relations Improvement project coordinator Armen Melkonyan presented trade turnover, its volumes and fields between the two counties. 70 businessmen participate in the third forum, introducing mainly construction, mining industry, jewelry, fishing, furniture production, tourism, and cargo transfers fields. 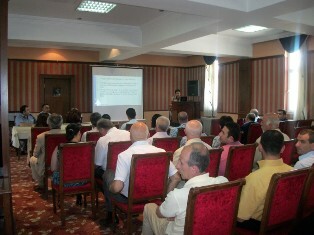 The first and second forums were held in July and November, 2011, in Yerevan.